This past winter in NJ was horrendous and we were shut indoors most of the time. Not how we like to be at all! Now that warmer weather is here, we have been taking advantage of it and spending tons of time outdoors. The boys are outside morning and night. They love to pass the hours playing football, swimming, frog catching and playing with the coolest RC truck I’ve ever seen. What is it? It is the RC Gator Monster Treads from John Deere. We were sent one of these bad boys to check out* and I am so excited to share our find with you! As one would expect from hearing the brand name John Deere, this remote control truck is rough and rugged. Stands up to the test of serious play and off roading when my boys are playing with it and that is saying a lot! There is a long-range of 50 feet, so they don’t have to hover over it to play with it and it lasts for a good 45 minute session. I can’t stand it when you only get 5-10 minutes out of a charge. The longer time allows for the kids to really test it out and have fun. A great feature on this truck is that you can go all directions. You are not limited to just going forward or backward. You can twist, turn every direction, flip over, you name it, you can do it! This is no ordinary remote control vehicle. I love the pneumatic wheels as you can literally go anywhere and do anything with this truck. 360 spins? Not a problem for the Gator. My kids are totally enamored with this truck, as it is so much fun to play with. My biggest complaint is only have one for them to share–something, I will have to remedy! It’s so sturdy, I am certain we will be able to get to play with it all four seasons. They can’t wait to have it go out on the snow! Want to pick up your own or learn more about it? Check out their website! Follow them on Facebook, too! 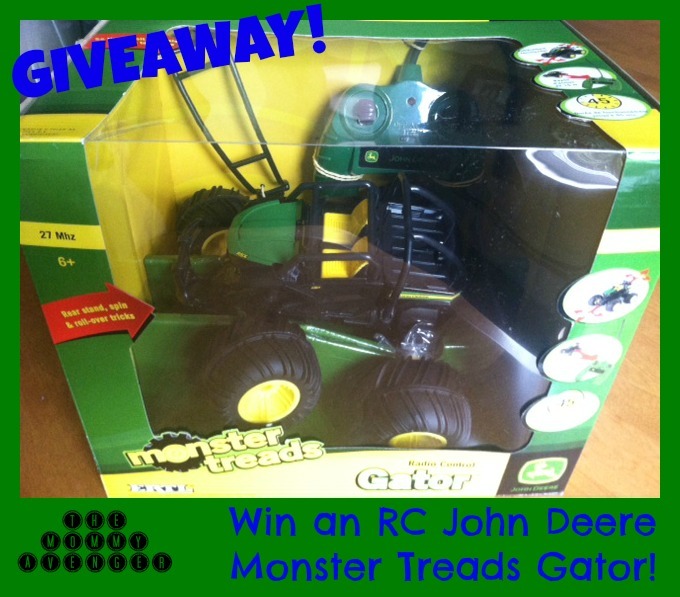 I am very excited to offer two lucky readers the chance to win an Remote Control John Deere Monster Treads Gator, courtesy of John Deere! To enter, email me at themommyavenger@hotmail.com with RC Gator in the subject line or by leaving a comment below telling me your way to spend a summer day! Please like The Mommy Avenger on facebook, pinterest and twitter for an additional entry (but leave a comment telling me you did!). Winner will be selected on or about July 31, 2014 by random via qualified entries and notified by email at that time. Open to US residents only. looks like a great product for the kids! And yes, this past winter was terrible here in the states- I was so happy to have missed it! Looks like a great remote control truck! I think my boys would love this. Maybe for their birthdays! I like playing around with motorized remote control cars/trucks.. it never gets old! Sounds like fun! I think my toddler would love this! Great giveaway! I know a lot of kids that would really enjoy this. A good book and lots of sun!! Our family loves having picnics. I like The Mommy Avenger on facebook, pinterest and twitter. I loved these types of toys as a kid. My parents hated getting them for me because they said I was too annoying with them. Looks fun and I love John Deere merchandise! I can see why they are enamored. I love that it does 360 turns! That looks like such a fun toy. I think my nephew would love it. if my kids were younger they would totally get into this . My boys would love one of those! Thanks for the giveaway. That’s going to be oodles and oodles of fun. I can imagine how it revs through the snow. Wow! My uncle who has a young son also loves playing remote control operated trucks and cars. I suddenly remember them when reading this post. What an awesome giveaway. Remote control vehicles are so much fun. I would play with them with my kids when they were little. I love how your family likes being outside. We are more indoorsy. Like bears in a cave. ;Lol. What a cute remote control tractor. My son would love it! that is awesome. I bet my nephew would love it! I had one when I was a kid and loved it! Was hours of entertainment! Looks like it could take a lickin’ and keep on truckin’! Nothing runs like a Deere and a John Deere remote control would be great, please count me in, then I will have my Deere to go with my hubbies Deere.. These are wonderful. What a cool product. I am sure kids will love it.